FABRIC: No label info – most likely rayon. lENGTH 31.5". Nice denim skirt from the 90s approx. Full skirt. Button fronted. Part elasticated waistband. Original 1980s Stonewash Denim Skirt. Lovely stonewash colour denim. Original 1980s Denim skirt. Original 1980s denim skirt. Lovely pale blue denim. Flared out skirt and front button detail fastening. The skirt will fit a waist 26" and the waist to hem is 30". Skirt is fitted at the waist, it flares out and is quite full. Original size is 14 but closer to a UK 10. Waist is 28". Length is 34". label is Match Set. Vintage Dorothy Perkins skirt from the 90s. Size: 12 Waist: 14 Inches relaxed & 20 Inches fully stretched Hips: 19 inches Length: 25 inches All measurements are taken laid flat. Black, midi length skirt with a purple floral pattern. It has a stretchy lining and the outer is a chiffon fabric. The hemline is a lettuce trim so gives a slight frill effect. The waist is elasticated so it’s nice and comfy. It is designed to be worn low on the hips, not high waisted. In excellent condition. Fabric is cord with a 90's 'dirty denim' style finish. original size is UK 16 but on the small side. Length is 23". Midi length with a flat front, and elasticated sections to the side, button detailing and most importantly - pockets (who doesn't love a skirt with pockets?!?!). The fabric is 80% cotton, 20% wool and is fully lined, so perfect for the cooler weather. Very lightweight polyester fabric - no stretch. Machine washable. Unbuttons all way down. Size 10 approx. Midi length skirt. Brown boho print. In great condition for its age! Front button fastening. Length: 31.5”. High waist fit. Model is a SMALL for reference. Polyester - no stretch. Machine washable. Size 14-16 approx. Made in UK. Pretty 90s floral print midi skirt by Opus. Great condition! Vintage 1970’s Brown Floral Print Flared Mini Skirt Grunge size 10 waist is 30’ Zip to back, Condition is Good original 1970’s very pretty St Michaels (M&S) I have converted size to today’s sizing. Elasticated back, Hip Pockets. Condition: Very Good. Machine washable. Very good condition. Size 10-16 approx. Great with Doc Maartens grunge style/boho/folk/and for festivals etc. Quite lightweight, excellent condition, no defects. ·New wool Midi skirt with single box pleat to the front and back, fully lined and zip back closure. Waist - 28". Black boho print skirt. Midi print. In great condition for its age! Beautiful floral button down vintage skirt for Spring/Summer. There was a black felt pen mark on the lower front part that has been removed but has left a residue of the product used leaving a small circle of blemished fabric. It is hardly noticeable to the naked eye. Half elasticated waistband. Beautiful iridescent buttons. Fully lined. Great with vest/cami tops. Please make sure to check condition, photos, specifics and description before purchase. Any questions please ask before purchase. Many thanks. Machine washable. Zip up back and button fastening. Size 12 approx. 100% polyester - no stretch to fabric. Zip up back with button fastening. Size 10 approx. Machine washable. Very good condition. 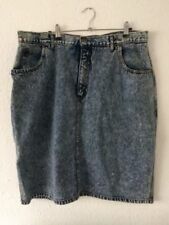 Vtg 90s LEE Denim Original Mini Alexa Kate Boho Festival Gig Skirt S 8 10. Condition is Used. Dispatched with Royal Mail Signed For® 2nd Class. Love this skirt very now very on trend an original skirt just cut short lovely blue soft denim button and zip fly . All original grab a bargain . Peach midi skirt. In great condition for its age! High waist fit. SIZE: Waist 25.5" - UK 8. Length 38.5". FABRIC: Rayon. Midi knee length. Black pleated skirt. Waist – 30”. High waisted fit. Length – 24”. In great condition for its age! Floral midi flippy skirt. Waist: 28” (unstretched). In great condition for its age! Length: 34”. Model is a SMALL for reference. 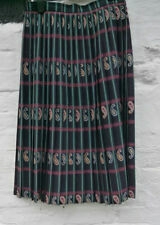 Vintage 90s Rose Print Pleated Skirt - Size 18. Condition is Used. Dispatched with Royal Mail 2nd Class. Button down (not working buttons). Length - 26”. Waist - 15” (not stretched), back is elasticated, so easy 2” more when stretched. Midi length. Black pleated skirt. High waist fit. Waist – 26”. Length –25.5”. In great condition for its age! FABRIC: Velvet. 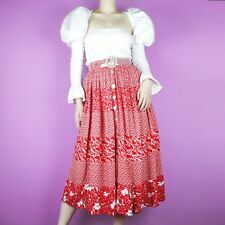 SIZE: 70cm waist – UK 10/12. Long length floral skirt. XS – UK 6/8. Black, cream and pink. Likely cotton. Model is a SMALL for reference. In great condition for its age! Turquoise green etc roses. Looks sz 12/14, no labels. Length- 30". Elasticated waist, lightweight. Pure silk- no stretch. Button up front all way down. Two side pockets. Size 8-12 approx. Elasticated waist at back. · Acid Bleach Skirt. · Cotton denim. · Mini length. · SMALL (UK 8) - Waist: 26". Length: 18.5". · Blue colour. Skirt is part elasticated at the waist, then flares out from the hip. Waist stretches from 29" - 33". Length is 30". High waisted skirt. Satin Lining. 29" length. Black and white checked pattern. Sheer top material. Used, but in great condition! SIZE: UK 12. Length 29". The skirt fastens with a hook and a zip at the back and has a short 8.5" split at the centre of the front. The length falls just past the knee and the hem has been left as a raw edge. This skirt would look amazing worn with chunky 90's boots and a velvet crop top. Ditsy roses rust golden yellow. Midi skirt. Button down front of skirt, mother of pearl. Looks Sz 14. Cream cotton feel viscose. Unlined, lightweight. Nice denim skirt from the 90s approx. Full skirt. Part elasticated waistband. Clean, tidy condition. Brown rust orange floral full. Labelled sz 14. Buttons down front. Length- 30". Elasticated back, unlined, non sheer. SIZE: Labelled UK 12 – has a 70cm waist, more of a UK 10 (SMALL).